The Blues had nothing going against the Montreal Canadiens, who were playing their first game without their leading scorer and they sat their star goaltender Carey Price. Down 2-0 in the third period, coach Ken Hitchcock was looking for a spark and put Jaden Schwartz and Paul Stastny together on the same line and it worked. 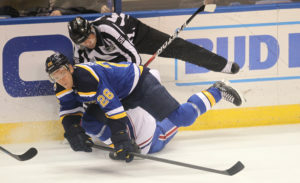 Schwartz scored twice, including the game-winning goal with 1:22 left in overtime to give the Blues a 3-2 win over Montreal at Scottrade Center on Tuesday. Schwartz had three points and Paul Stastny had a goal and an assist for St. Louis. Jake Allen made 28 saves and is 8-0-0 in his past eight starts; he’s 10-0-2 at home this season. The Blues have points in 13 straight home games (10-0-3) and are 12-1-3 at Scottrade Center.